Combine goat cheese, crème fraiche, and minced chives. Portion on ravioli dough and cut into individual servings. Note: should you prefer not to make fresh pasta dough, wonton skins can be substituted. Wrap beets in foil and roast at 350 degrees until tender. Cool, peel and slice very thinly in the style of carpaccio. Caramelize vinegar and honey. Add remaining ingredients and reduce by half, strain. Carefully arrange beet carpaccio on one side of plate and drizzle with olive oil. If using wonton skins for ravioli, lightly sauté and arrange three on opposite side of plate. 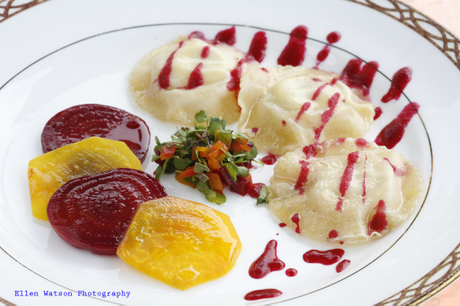 Drizzle ravioli with gastrique and garnish center of plate with beet salad. Thanks go out to both Chef Doug and our resident photog, Ellen Watson, for the great dish and the picture. even if I wasn't vegetarian this would make my mouth water, but since I am, I am practically drooling.